KUALA LUMPUR: The Government needs to address the issue of affordability of residential properties as persistently high prices have become an issue to many people. “We have computed the affordability (issue). Prices have risen to a level that has created some concern. In fact the International Monetary Fund (IMF) in its Article 4 consultation report has mentioned that this is the main risk or vulnerability facing the Malaysian economy: overvalued house prices,” Ratings Agency Malaysia Holdings Bhd (RAM) chief economist Dr Yeah Kim Leng said. “It is not a bubble yet largely because for certain segments the income level is sufficient to absorb those kind of (high priced) houses. But there comes a point where you will find declining demand largely because of rising vacancies or declining rental yields that will help to cap property prices,” Yeah told journalists at a press briefing yesterday after RAM's annual general meeting. Yeah expected an eventual soft landing for the property market in Malaysia but also said that developers should be ready for any change in market dynamics. “Developers must take the risk that should there be a slowdown or market crash (that) they are in a position to absorb it without creating problems for the banking sector or economy. 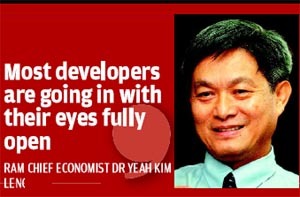 But at this juncture we are quite comfortable that most developers are going in (to the market) with their eyes fully open,” Yeah said. “Most of the property companies that we have rated (credit rating) are fairly strong in their credit quality. Overall we are looking at maybe certain smaller developers that will be at risk but by and large I think that the property market is in a sustainable basis. But watch out for too high prices that will create affordability problems,” he added. Meanwhile, RAM's CEO Foo Su Yin said the agency expected corporate bond issuances for the whole of Malaysia will total between RM80bil and RM85bil this year from about RM70bil in 2011 noting that issuances had accelerated in the first four months in 2012 compared to the previous year. “The issuance in the first four months of RM44bil has already exceeded what was (at the level) half year last year so the RM80bil-RM85bil is achievable this year. We expect most of the bond issuances to come from the infrastructure and the banking sector,” Foo said. On another matter, Yeah said that the Malaysian economy should be fairly protected against any economic shocks that comes out of Europe due to the ongoing economic crisis there and that the first quarter economic growth may even beat analysts expectations. “Domestic demand has been fairly robust and with slightly firmer exports we should be doing fairly well. Nevertheless the risks still remain substantial because of the, so-called, regime changes that had happened in Europe that put the whole Euro at risk. Malaysia has so far been able to ride through the soft patch in the global economy,” he said. Meanwhile, on the issue of the growing government debt or also known as deficits of presently about 56% of GDP, Yeah said this figure may hover at about 56%-57% by the end of this year and said debt should ideally be used to finance productive investments to ensure future economic growth. He also said the risks from the non-bank lending sector also known as the shadow banking system could be limited as its portfolio was relatively small compared to total bank loans portfolio and may not pose a systemic risk to the economy at this point in time. “We may have however, isolated problems arising but it should not pose a systemic risk to the economy or banking sector,” he added. The RM500 million shopping mall in the Klang Valley is expected to be completed in 2016. KUALA LUMPUR: Sime Darby Property, the country’s largest developer by landbank size, plans to develop a RM500 million shopping mall in the Klang Valley, in partnership with CapitaMalls Asia Ltd. The mall, to be located on 242,000-sq-ft freehold land in Taman Melawati here, is expected to be completed in 2016. It will have a net lettable area of around 635,000 sq ft and serve a catchment population of about 800,000 people within a 10-minute drive. agreement to form an equal joint venture to undertake the project. “We are confident that our partnership with CapitaMalls Asia to develop this site is the best strategy to maximise returns on our investment and diversify our income portfolio. 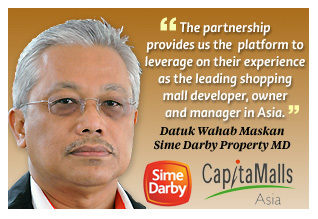 “The synergistic partnership provides us the platform to leverage on their experience as the leading shopping mall developer, owner and manager in Asia,” Datuk Wahab Maskan, Sime Darby Property’s managing director said in a statement yesterday. The group owns five other malls in the country, namely Queensbay Mall in Penang; Gurney Plaza, also in Penang (owned through its stake in CapitaMalls Malaysia Trust); a majority interest in Sungei Wang Plaza in Kuala Lumpur; The Mines in Selangor; and East Coast Mall in Kuantan, Pahang. Its chief executive officer Lim Beng Chee said the new mall would cater to the under-served retail needs of the residents in the area. The mall is surrounded by the residential areas of Taman Melati, Wangsa Maju, Taman Permata and Kemensah Heights. PETALING JAYA: Sime Darby Property and CapitaMalls Asia Ltd have entered into a conditional agreement to form a 50:50 joint venture to develop a shopping mall on a freehold site in Taman Melawati, Kuala Lumpur, at a cost of about RM500mil. The site had an area of about 242,000 sq ft and is the last sizeable plot of commercial land in the township, the companies said in a joint statement to Bursa Malaysia. Both companies will develop the shopping mall with a total net lettable area of about 635,000 sq ft on the site. The mall is expected to be completed by 2016. KUALA LUMPUR (Reuters): Malaysian investment fund Permodalan Nasional Bhd (PNB) is seeking a 628 million pound (us$1.01 billion) five-year term loan to take out two six-month bridge loans for its shopping spree on three landmark London properties, a Thomson Reuters publication, Basis Point, reported on Thursday. Basis point quoted sources as saying said PNB has been in talks with around seven banks, including Bank of Tokyo-Mitsubishi UFJ, Mizuho Corporate Bank , OCBC Bank, Scotiabank, Standard Chartered Bank, Sumitomo Mitsui Banking Corp and UOB to arrange the facilities. The first bridge entailed a StanChart-led facility, which will back the 350 million pound purchase of Milton & Shire House on Silk Street, the current headquarters of law firm Linklaters, Basis Point added. The Malaysian government-linked fund planned to borrow a 250 million pound loan to take out the bridge earlier this year, but it decided to get the larger-sized new loan after it went on to buy two more London properties, according to Basis Point. PNB has bought three London office properties since the start of the year, two of which were acquired from German fund KanAm for about 570 million pounds.